This past Wednesday I conducted our first ever co-ed craft lunch at work. Yes, that's right, you read it correctly; co-ed. The men always make fun of us women for our craft lunches, but we all know that deep down inside they are jealous of our craft projects. 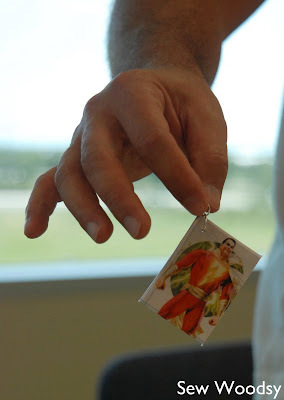 When I ran across these comic book necklace pendants at Punk Projects I knew this would be our first co-ed craft project at lunch. I immediately sent the invite via entourage and just as I suspected I got quite a bit of positive feedback. Since the pendants are small I went to the store prior to our lunch and bought the chip board (we used a matte board since Michael's did not have chipboard), contact paper, and I brought the jump rings and necklace rope from home. All I asked is that everyone contributed one dollar towards to cost of supplies and that everyone either a.) bring their own comic book to cut up b.) print off comic book pages from the internet. Everyone went with option "b" and a few of the ladies decided to opt out of comic books and pull from the pages of there favorite magazines! This is a super simple 10 minutes project. First, you will want to cut out your chip board. Then you'll want to cut out your comic (about 1/4-1/2 inch longer/wider than your chip board). Next, you will cut out contact paper that is about 1/4-1/2 inch longer/wider than your comic. Remove the paper off the contact paper and place your comic strip face down on sticky side (make sure its well centered). Then you'll want to cut slits in the corners with a pair of scissors, and start folding over your comic/contact paper on the chip board. Take a thumb tack and poke a hole in the pendant, with pliers attach one to two jump rings, add necklace or key ring if desired. You could skip the hole and jump rings and make this a magnet! I love how Karen's pendant turned out (and this photo)! Here is a picture of what Sarah's (non comic book) pendant looked like. Kristi, from The "Unknown" Florida opted for the non-comic pendant as well. Thomas cutting out the contact paper for his first "keychain". Here is Thomas with his second "keychain"! He even grabbed materials to make a third! Isn't this darling? What five year old wouldn't love this!?!? 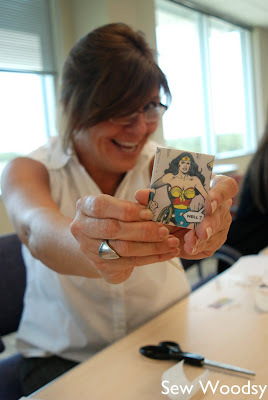 I love looking at these pics of your at work lunch crafting. They crack me up...and you are a super cool person to do this for your co-workers. Nice. These are REALLY fun - thanks for sharing the how-to as well!